NeuroHope is a 501(c) 3 charitable organization that strives to make longer-term, affordable access to cutting-edge rehabilitation in Indiana a reality. We provide individualized physical therapy and wellness programs, specialized for people living with and recovering from spinal cord injury, brain injury, and stroke. NeuroHope was the recipient of the 2015 Care Innovation Award from the Foundation for Complex Healthcare Solutions, a 2016 Healthcare Heroes award from the Indianapolis Business Journal, and received expansion support from the Indiana Spinal Cord and Brain Injury Research Fund from the Indiana Department of Health. The injured and their families find themselves in an ICU confronted with a reality that they never dreamed could happen. As they move to a rehabilitation hospital, begin physical therapy, and eventually are discharged the shock wears off, but the need for help continues as recovery evolves and new complications arise. NeuroHope strives to make long-term access to cutting-edge rehabilitation in Indiana a reality. The NeuroHope mission extends beyond rehab. We are devoted to better the lives of those already living with paralysis by offering specialized, activity based wellness programs. Recovery from neurologic injury is incredibly slow. Even the most incomplete SCI may take months or years of rehabilitation. Insurance does not provide a continuum of care. The injured are often discharged from rehabilitation hospitals weeks after injury, during the critical time they need therapy the most. Outpatient visits are few and far between. Recovery requires regular, repetitive access to therapy in order to promote neuroplasticity (the nervous system’s attempt to re-wire after injury). The limited number of outpatient therapy visits provided by insurance are insufficient. (to improve circulation, muscle and bone density, pressure sores, and more). 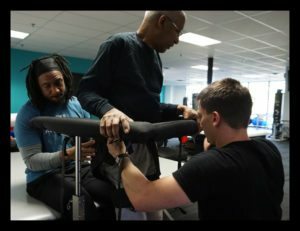 Our vision provides the resources to maximize recovery for the recently injured, and offers specialized wellness programs for those already living with paralysis so they can lead active and healthy lives.